One Eyed Jack is here with the first Pirate101 game play tip article, some tips on how to pick the perfect Pirate! How did you lose your parents? How did you get arrested by the Armada? It’s the backbone of Pirate101 and makes for some really fun re-playability because if you chose different answers for each of these questions – you’ll experience the game differently. Sure, you’ll still be crashing your way through the Armada’s forces and finding all the pieces of the map to El Dorado, but these small choices will cue certain punch lines and apply game altering affects for the rest of your character’s Pirate101 existence. This post will attempt to demystify a few of these choices. 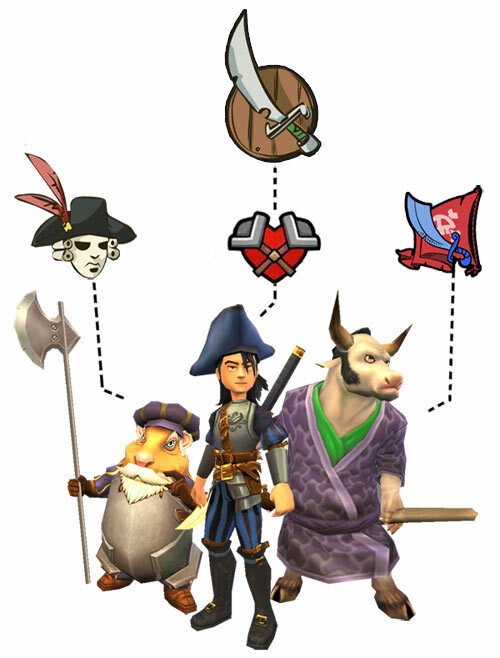 Below is an example of how the choices you make early on will affect your Pirate later in the game. 1- The “How you lost your parents” question will directly impact which companion you receive after you completed the “Presidio” dungeon of Skull Island. A good Internet search will yield information from pretty much every fan website out there, so to avoid spoilers, we’re not going to give you them all outright! However, choosing storm will net you a Swashbuckling companion, choosing shipwreck will result in a Privateer companion, and if you lost your parents to any of the other choices, you’ll receive one of three really awesome Buccaneer companions. All of them are great companions, so you can’t go wrong with your choice here. These “Presidio Five” companions will talk to you throughout your journeys, and each has their own distinct personality. Moreover, each of these companions knew your parents personally, so they will share insights about them when the situation arises. 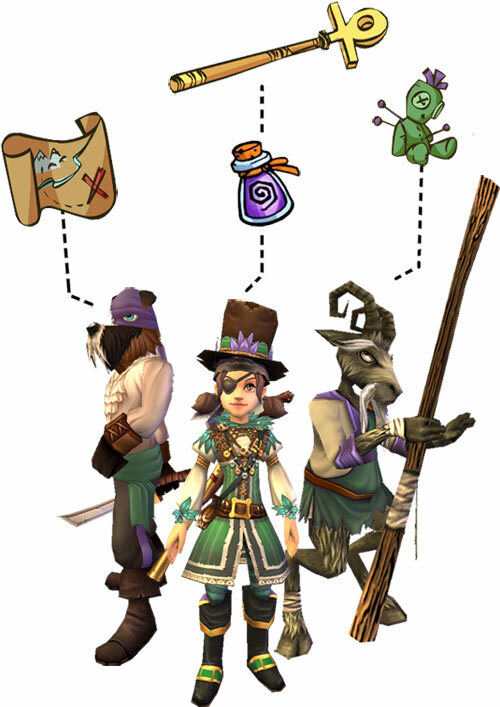 If you like finding all the unique little tidbits in the Pirate101 story, make sure to choose a different path for each of your different Pirates! All of these abilities play into a major question – which class will you be? As a Witchdoctor, it would seem Naturally Spooky is an obvious choice, correct? But what about Privateer? Naturally Spooky will help them with their healing, but arguments could be made for any of the choices above . . . it really comes down to how you like to play your character. If you like to put them out in the middle of the battle, you might choose health or dodging. If you like to do a lot of damage, you might be swayed in that direction, and almost everyone can benefit from accuracy because it’s better to hit your target more often than not, right? The debate is endless, but we definitely like to give you a lot of options here because we know you love options! 3- The last and most impactful decision you make is why the Armada arrested you — that directs both your class and your starter companion. Whether it’s hoodoo, dueling, brawling, treason, or smuggling, you’ll be off to adventure with one of what we like to call “The MooShu Five” companions. Just like “The Presidio Five,” “The MooShu Five” companions are powerful allies who will banter with you throughout your journey and serve as faithful companions with several promotion quests. They are awesome! Keep them leveled up and they will help keep you alive. See you in the Skyways and thanks for reading. I never knew how much time went into the game. swashbucklers and buccaneers don’t have high base health. I think it makes sense that they made the name for the starter companions, “The Mooshu Five” Because all of them are actually from Mooshu! Hi! From, Kindly Mason Fisher, Level 8. Very energetic post, I loved that bit. Will there be a art 2? lvl 65 is the best,especially when your a bucanneer or privateer you get heavy armor and you can get really cool close. I agree with Damian. My ostrich is lvl 11, and it has helped me finish fights faster and easier. i have played this game 2days and 2nights but i never get bored.My name in pirate101 is romantic victor cog. Hi! My name is Bloody Tanner Xaixer, level 16. Hi my name is Merciless Richard Chamberlain! I’m a level 65 swashbuckler! I think swashbucklers are the best because, they get the highest dodge. My dodge is 229. Another reason is because of the poison, black fog, and lots of attacking powers. They also have dance of steel! When I did it while hidden, I did about 1200 damage to three enemies. Last, their weapon power is high! My weapon power is 342! I believe Swashbucklers are sick because I am a swashbuckler and they have an awesome move called dance of steele. I never tried it but I have seen it in a walkthrough. It was totally cool! I am a level 18 swashbuckler. My companion is Subodai.